WHY BROAD ALSO MAKES ELECTRIC CHILLER ? 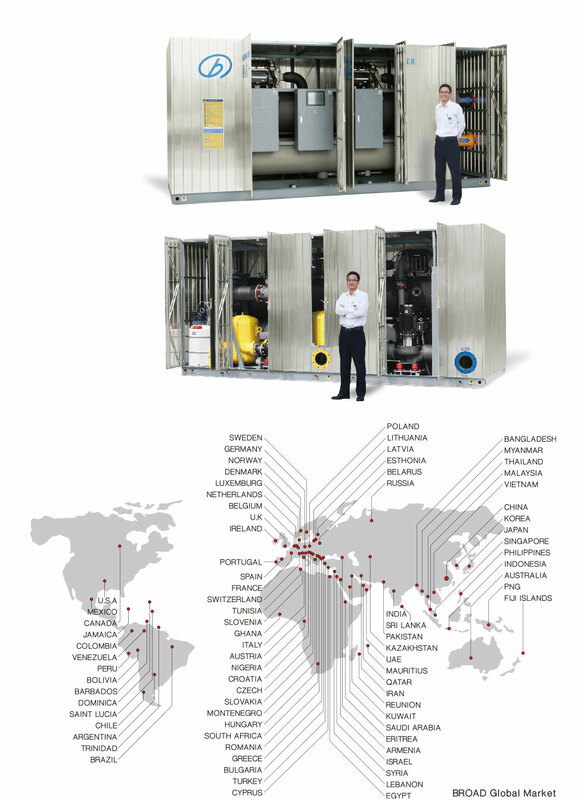 BROAD non-electric chiller is the world's most efficient equipment when evaluating the efficiency of "primary energy", also it is the only central air conditioning that can generate chilled water, heating water and sanitary hot water with the highest reliability, the longest life span and the quietest operation. However, the following reasons determine that we are manufacturing power-efficient chiller now. 1. Many areas have no access to natural gas or waste energy sources. 2. Some inquires need cooling only, or the yearly operation time is too short to use multi- function air conditioning. 3. Specific locations powered by wind, hydro or solar PV has great potential to reduce CO2 emissions. 4. BROAD Power-efficient Chiller is more efficient than traditional electric chillers. 5. BROAD Packaged Water Distribution System is more efficient than traditional distribution systems. 6. BROAD Power-efficient Chiller can be combined with BROAD non-electric chiller and BROAD CHP system, which has higher efficiency and energy flexibility than single energy source equipment. The Integrated Part Load Value (IPLV) of the chiller can reach 10. This high IPLV can reduce energy consumption by 40% when compared to traditional electric chillers. BROAD Packaged Water Distribution System can reduce electricity consumption up to 76% when compared to conventional field-built systems. The magnetic oil free and zero friction technology can save up to 40% energy cost and 90% of maintenance cost when compared with traditional electric chillers. BROAD PLC "Smart anti-surge control" module insures the chiller always operate in a safe range. The integrated design of the BROAD chiller, water distribution system and stainless steel metal enclosure reduce design cost and field installation costs for customers. 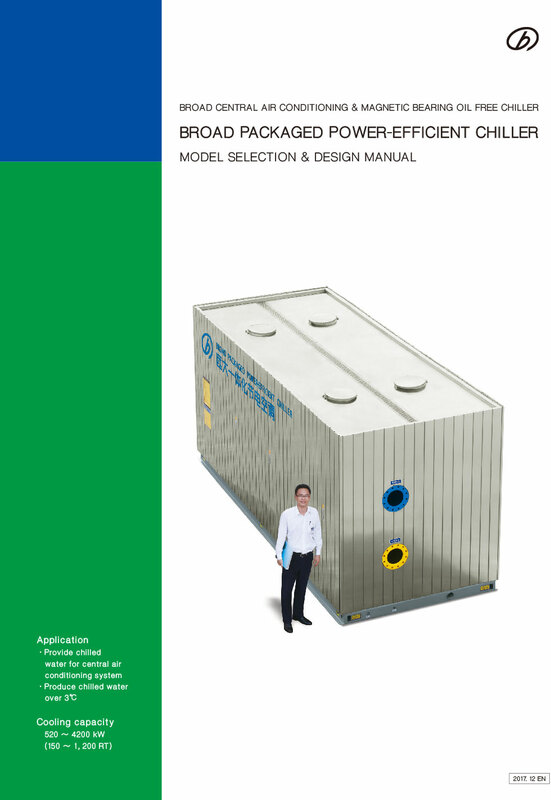 Compared with the traditional electric chillers, BROAD packaged chiller reduces volume by 30~50% and weight by 30%. BROAD Packaged Water Distribution System and stainless steel metal enclosures can be installed outside which reduces mechanical room footprint requirements. BROAD Packaged Water Distribution System and stainless steel metal enclosure eliminate risk and reduce system design, procurement and installation errors. BROAD Intelligent Control System (ICS)can be automated for free operation of the chiller and water distribution system. 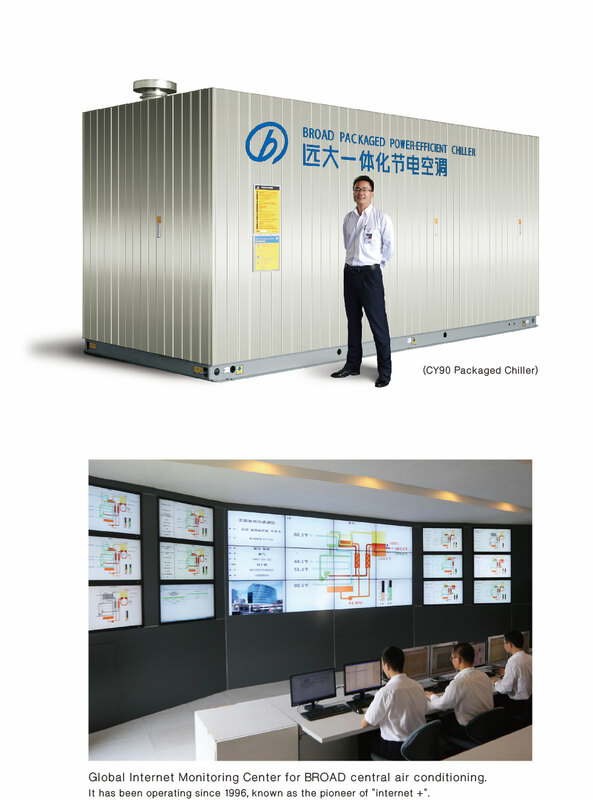 BROAD Global Internet Monitoring System provides customers with 24/7/365 fault prediction, analysis and energy-saving management tools.